As we drift decidedly toward the end of summer, with shorter days and longer nights, my garden remains enveloped–in what I hope will be–the last warm, humid breath of summer. Prior to the formal advent of autumn, Harvey rains prompted a flowering boon throughout the garden. Blossoms abound for gardener appreciation and insect pollination, including flowers and their pollinators rarely seen. 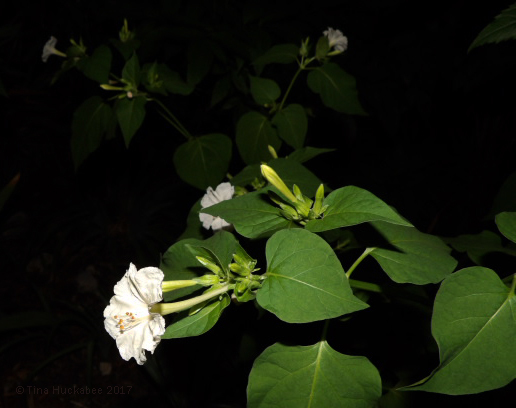 Four O’clocks, Mirabilis jalapa, are passalong plants common in southern gardens. Not native to Texas, they’re believed to have been cultivated by the Aztecs in Mexico before the Europeans arrived in the New World. Linnaeus recognized this plant by 1753 and over the centuries, these pretty and hardy bloomers have become popular garden additions everywhere. …or white individuals that now call my garden home. …while the whites demonstrate their individualistic streak. No matter, as I gratefully accepted the gifts and value their blooming beauty briefly each spring and then again, in greater glory, during late summer and fall. 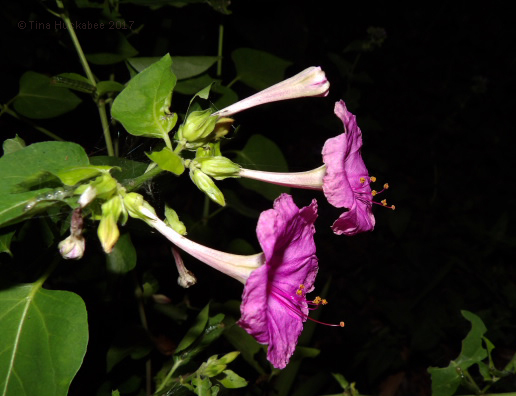 While I didn’t observe any moths proboscises-deep in the blooms as I shot these photos, these nighttime lovelies are open for those who prefer the cover of darkness for feeding pleasure and pollinating duty. 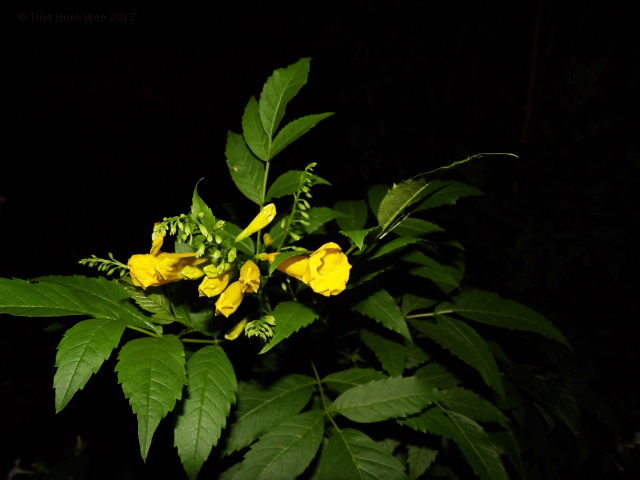 Not to be outdone in the dark, this preparing-to-blossom Yellow bells, Tacoma stans, begged for attention while overhanging a Four O-clock. These clusters of sunshine will have to wait for morning’s light to provide for bees, hummingbirds, and butterflies. 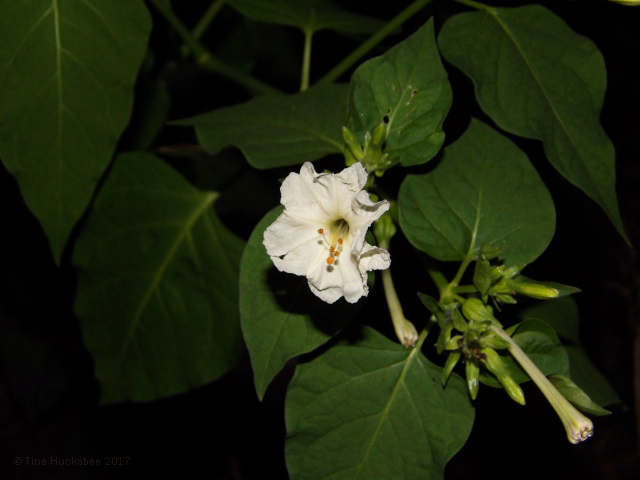 This entry was posted in Night blooming flowers, Uncategorized and tagged Four O'clocks, Mirabilis jalapa, Tacoma stans, Yellow Bells by Tina. Bookmark the permalink. 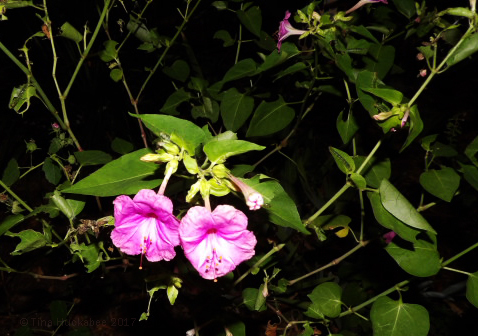 I never met four o’clocks until I moved to Houston. A friend’s parents, who lived inside the loop, had the flowers in a little garden between their garage and the house. For years it had been a well fertilized veggie garden, and then they added flowers. One year, they decided to get rid of the four-o-clocks. The plants had exploded, and were at least five or six feet high. They dug and dug to get to the bottom of the roots, and finally discovered there was a root ball the size of a very, very large beach ball. Two men couldn’t lift the thing. It was the most amazing sight. Those delicate little flowers were intent on staying right where they were. 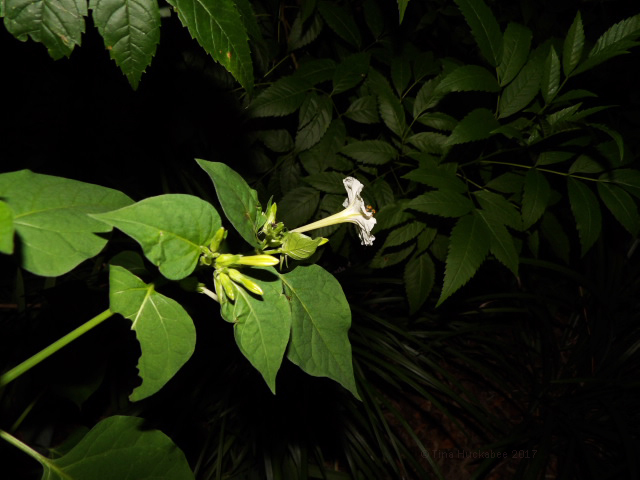 Eventually, they got it out — or so they thought, until the next year, when four o’clocks started appearing in the garden again. Haha–I knew the tubers get huge, but beachball size is impressive. I’ve actually thought about whether I should pull these (and another that has seeded out into a different part of the garden), but they’ve been so pretty this year…. That said, I walked out this morning and the pink one has been eaten up–only its green skeletal remains are standing! Some research will need doing this weekend! Oh, so beautiful! 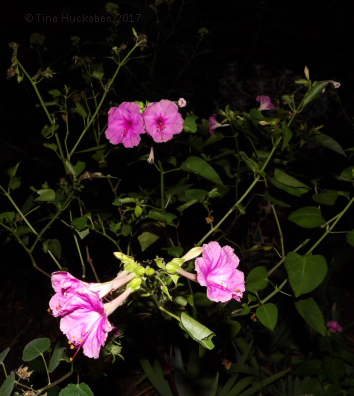 I love this presentation of nighttime bloomers. Thomas Edison’s wife, Mina, planted a moonlight garden at their Florida estate. It’s still maintained as part of the publicly accessible Edison and Ford Estates. Your images bring back sweet memories of touring that unique garden. Lovely! Thank you, Beth. I’m reading “American Eclipse” by David Baron and he profiles Edison in connection to the 1878 eclipse; he also mentions that Mina was quite the gardener. I’ll bet that garden in beautiful–glad you have such good memories of it. Lovely to see them in flower in your garden. They seem to be having a poor year here with very sparse flowering. Love the white one particularly. Thanks–you know, they don’t always look good in my garden. In fact, I pulled a couple of them a year or so ago, they just never bloomed and the foliage always looked yukky. I also like that white one; I love white flowers in the garden. Such intriguing plants. Here they are grown as annuals. I keep meaning to try them, but never have. I’m sure your winters would take care of the roots. 🙂 I’ve had mixed results: these two are the most successful and beautiful that have ever been in the garden. Funnily enough, two days after I posted, the one with the pink blooms was stripped of its foliage overnight. I have no idea who had such a feast, but the plant was all green skeleton. It’s leafing out once more, though I doubt it’ll bloom again this fall,though it might. The white one is gorgeous and I make a point to check it each evening. My colleague in Southern California and I were just talking about these, and how different colors have different fragrances. I really like the white ones, but they lack fragrance. The bright pink ones that I dislike have the best fragrance. they have become almost invasive in town. I do not have any at my home garden now. Hi Tony! Yes, you’re right–all of the above. Four o’clocks can surely be invasive (I’ve yanked all the seedlings that I decided I didn’t want) and the pinks smell better than the whites. I do so love those white flowers though….